← A learner theory or a theory of learning? CCK08 – In my student days in South Africa, a local hit song imprinted on those biochemical pathways in my brain that connect me through memory and music to 1984. Niki Daly’s “Is it an ism or is it art” didn’t really comment on the UDF, school boycotts, and the rising tide of resistance to apartheid – but it did make us arty types think more deeply about the relationship of artists to critics, the reification of artistic fads, and I suppose the album as whole did question the white dream of insulated existence in the larney suburbs…. The first 3 weeks of CCK08 evoked that song for me as I trawled through the blogs and lurked in the Moodle forums – skimming the posts, assimilating and accommodating, just immersing myself in the network in a passive kind of a way, feeling a tad guilty as I took precious time out of a busy RL day to follow some threads. Got a feel for it now and can hopefully start contributing back into the conversations. I started out doubtful that ‘connectivism’ provides anything really new or useful for education theory – a theory of learning needs to explain a lot more than how code, electricity and screens can link learners together. But connectivism does seem to be pointing towards that something more … But after 3 weeks I’m still not clear about where is connectivism is pointing, or how it fits in with my own schema of what learning/teaching is. For there can be no learning without teaching, and that is not the same as saying that a person called a ‘teacher’ is necessary for learning to take place… but that is another conversation…. When it comes to the -isms, I’m an enactivist. That is, I believe that enactivism is the -ism that provides the most appropriate and useful theoretical context for the ways in which learning and teaching is developing in the networked world. I suggest that if ‘connectivism’ is ever going to have any theoretical legs to stand on, it needs to clearly delineate its affinities with and differences from enactivism. As a way of starting this conversation I’ll revisit Brent Davis (a lot of enactivists seem to hang out in Canada ) and his wonderful genealogy called Inventions of Teaching. I want to put the focus on teaching because it’s all too easy in ‘connectivism’ to forget that teaching is actually an integral part of learning. I mean, when Stephen claims that the network has actually replaced the teacher – “content from elsewhere in the network will, if it is of value, make its way to you. That, indeed, is the value of working in a network” – I think it’s really important for those who see themselves as educators and make their living as teachers to question this somewhat dodgy ideology. On the face of it, ‘connectivism’ should be located on the Interobjectivity – Complexity Science/Ecology bifurcation – which is where I have situated enactivism. There doesn’t really seem to be anywhere else – I don’t think that it is behaviourism in another guise – and although there might be some mystical elements and some quasi-religious dogma (Catherine ? 🙂 ), I don’t believe that this is where George and Stephen are intending to go. Or is it a completely new branch splintering off on its own somewhere ? This entry was posted in , CCK08 and tagged CCK08. Bookmark the permalink. 12 Responses to Is it an -ism or is it art ? Thanks for your thoughts here, Stanley. The mapping, and your discussion of it have really provided me with a new way at looking at the issue(s) I am trying to come to grips with: where does connectivism reside in the schema of things? Funny thought though, I have this hunch that the fathers of connectivism might suggest that it does not belong in a schema at all, that somehow the very concept of schematizing has no value in connectivist theory, being based on symbolic representation et.al. I shall ask them this directly, and make reference to your post here, hoping you don’t mind. The tree is irrelevant, because it is (a) not accurate as a genealogy of these various theories, and (b) merely one of many ways of dividing the various spheres of philosophy. It’s a nice tree, but we should not infer anything from the design of the tree to the nature of the discussion. > But to get onto this tree, �connectivism� needs to define its conceptions of teaching. I have said on many occasions that ‘to teach is to model and demonstrate’. The point is that teaching is showing rather than telling, doing rather than demanding. Hi Stephen. I see this tree as a good way to start the discussion. But you seem to dismiss it out of hand. What alterations would you make to this tree? Can you show me a better, more accurate tree then, or at least another model(s)? I found your blog very enlightening, still a bit dense for me and my thin knowledge base. Thanks for sharing the “three”, right or wrong (I am not in a position to judge) it shows a comprehensive view of learning theories. I wish you had posted a link to the song, I am not familiar with it, I did search for it with no luck. I guess I would have enjoyed your post more if I had the context at hand. As psychologist I am familiar with behaviourism and I don’t think Conectivism fits there but… I am not biting either. I am not convinced that Connectivism is a learning theory and I don’t think there is yet a way to prove it. More research is required. Maybe, data from this course will help out, who knows. It is too early to be defined. The very vehemency in Stephen’s words, here and in the forums, leads me to think that he is blinding himself, that will make even more difficult to prove himself right. Sorry Stephen, I am not versed in philosophy or neuroscience, I am versed in human psyche; it is from that ground that I speak. I will post my first paper and there I will be able to abound in my point of view. Though I know that if I do not show the “proper” citations my views will be easily dismissed as ungrounded. I don’t want to prove if I am right or wrong. I want to see if this way of releasing knowledge, I cannot see it as teaching either, is practical, useful and really leads to widen participant’s knowledge in a solid way. Hi Stanley, I found your posting thought provoking. I had rejected out of hand the behaviourist connection. And had yet to blog my reactionary thinking on the humanistic potential that had not been explicitly expressed in connectivism to date. i suggest an insertion of humanistic, (student-centred learning) on the diagram in the gap between emancipation and participation. Where humanistic approaches have since moved is into transpersonal approaches, and this could be worth exploring as knowledge is shared, not individually located, and is more in flux. A psychosynthesis approach would extend this further again, but i have not had enough meditational or metaphorical immersion (yet) to be able to do more than suggests such isms may be less important than the arts for invoking or representing understanding. Hi, I found this tree to be a great stimulus to thinking about connectivism, mostly because it wasn’t located in the tree. When I look across the tree from left to right with the concept of teacher control of the learning environment in mind, there seems to be a reduction in this control. More that the control becomes less direct. Connectivism seems to be a model where we as humans return to a process where the environment is there to teach us (and our minds are not that good at discriminating between a real environment and a virtual one), with less of an intermediary human between the environment and the learner. But, the place of the teacher is still clear in that by providing structure within the virtual environment and subtle direction through the environment, the learning outcomes can be achieved. Stephen – thanks for the compliment about the tree. I used an open source application called Fractal X to draw it (concerns about copyright on reproducing the original image from the book). Maru – I searched for a link to the song by Niki Daly but it is not available on iTunes or any other site where you can legally download it 🙁 I look forward to reading your thoughts about connectivism on your blog. Scott – I agree that the direction is towards less teacher ‘control’ over the learning environment and hadn’t noticed that pattern. My worry though is that connectivism places too much emphasis on the network as teacher without any mediating influence or ‘scaffolding’. Teachers differ on the level of scaffolding applied depending on the stage of development of the learning for the students and often apply a cycle of high control and low control so would traverse many parts of the tree. The advantage of learning via virtual media seems to be that an immersive environment can be created on abstract notions or at least ones which can not be fully realised in conventional teaching media, the thought/concept becomes the environment. Once the mind is convinced it is the environment, we can use our human sensory experience to learn from it rather than via another’s interpretation of it. Now that is different, the only other way (which occurs to me) to achieve the same goal with students is through guided imagery and the results from that, for any individual child, very wildly. There is no teacher. You’re going to need to give 2 hours to this comment Stanley, only to come to the answer you already knew. The final audio visual quote has the most direct relevance to your post I think, but I hope you manage to view it all – even through the distopic utopianism. I hope you find it interesting. Nice analysis. 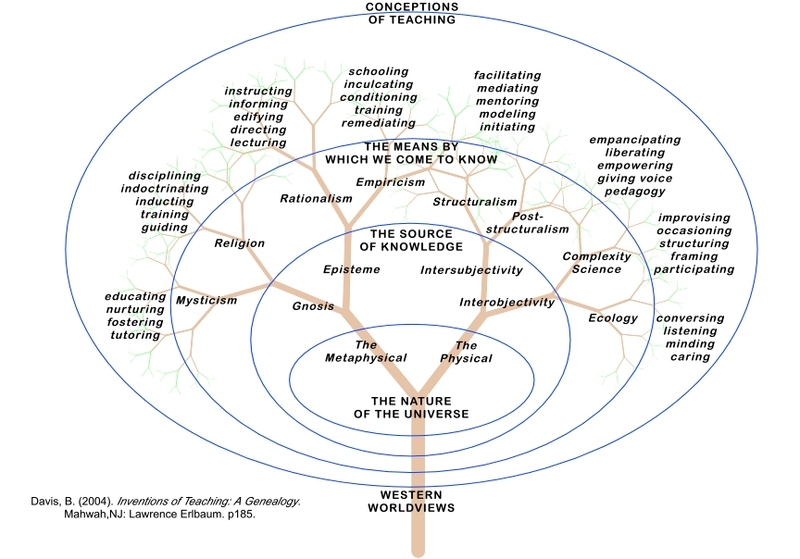 It’s a shame the diagram was dismissed out of hand, as Brent Davis’ work on enactivism and complexity theory (in various books of his) perhaps holds the best foundation for connectivism to be viable as a theory of learning. I find it odd too that even though they argue a link between connectivism and neuroscience, there is no mention of connectionism – which has been criticized by various people (but still not rejected as useless). For example, connectionism views everything as being represented by nodes in a network, too, only contained within a brain or computer.